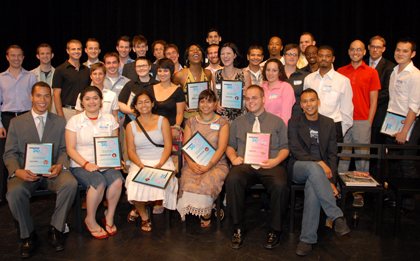 The 2007 Windy City Times 30 Under 30 Awards ceremony was held June 20 at Center on Halsted, 3656 N. Halsted. All but two of the honorees were able to make the event, and many brought fans, parents, family and partners. The awards are co-sponsored by AIDS Foundation of Chicago, Chicago House, Howard Brown Health Center and Chix Mix Productions. Windy City Media Group's Amy Matheny and Season of Concern's Stephen Rader were the co-hosts. Photos were taken by Kat Fitzgerald.